Pollinating plants, growing succulents from seed, and keeping the Garden looking good! Take a deeper dive into the wonderful world of the Curators at the Ruth Bancroft Garden. 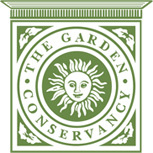 Gain valuable gardening insight to implement in your own yard and find out what’s new in the Garden. With the help of a grant from The Saratoga Horticultural Research Endowment at The University of California, Davis, Curators Brian Kemble and Walker Young are testing the hardiness of five Aloe hybrids created by Kemble over the last 35 years. The most commonly available hybrids now have been produced in South Africa for their dramatic flowers, and in southern California for showy leaf patterns. Kemble’s Aloe breeding has had the goal of producing striking flowers and foliage, with the hardiness necessary for northern California climate. Data collected will help determine the top performers to be put into tissue culture for introduction into commercial use, hopefully resulting in up to 5 new Aloes for use in California landscapes. 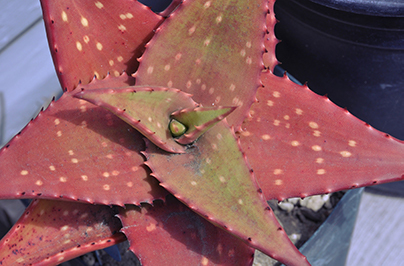 Aloe zubb x squarrosa: A clumper with curled-back, light green heavily spotted leaves; flower stalk is branched with yellow-orange flowers. 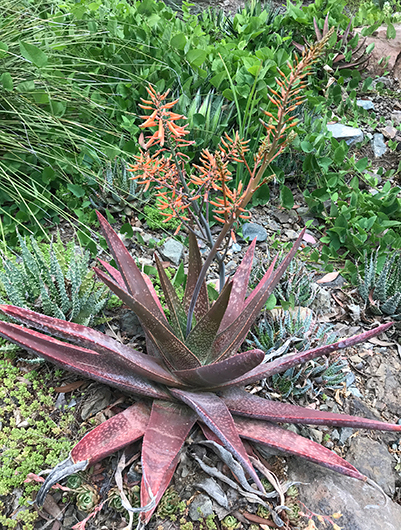 Aloe ‘Rubin’: a relatively compact hybrid with four species in its parentage: Aloe humilis and Aloe brevifolia from South Africa, Aloe zubb from Sudan, and Aloe squarrosa from Socatra. It forms mounded clusters of 6 inch heads with short spotted triangular leaves. In shade plants are green, but in sunnier positions they become purple-tinged. Flowers not known. 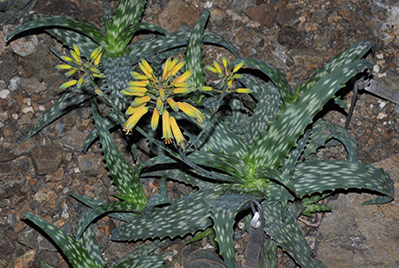 Aloe buhrii x reynoldsii: produces rosettes to 18” in diameter; is a stemless clumper with wide choral edged leaves; much branched flower stalk to 18” high with yellow- orange flowers. 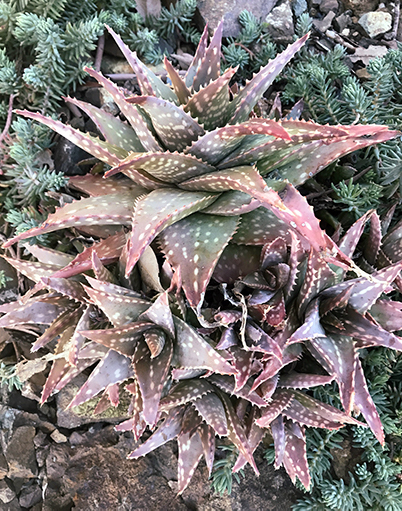 Aloe pearsonii x mitriformis: either upright or horizontal growth clumper with stems of stacked triangular shaped leaves, becoming purple-flushed in sun; red flowers in a round cluster in summer. 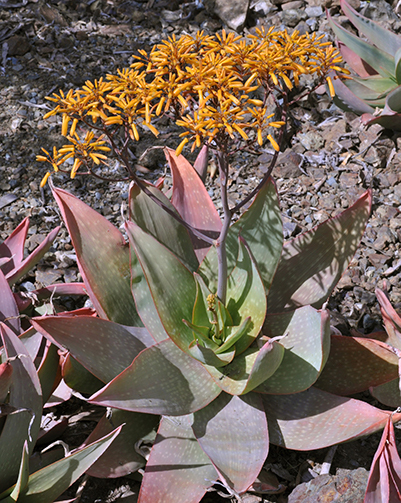 Gasteraloe ‘Luman’: produces rosettes to 1’ in diameter; is a stemless clumper, with spotted leaves that take on a pink, orange and reddish tinge in summer; orange tubular flowers on a branched stalk. To find out more about which Aloes can thrive in your garden, check out Brian Kemble’s List of Hardy Aloes. 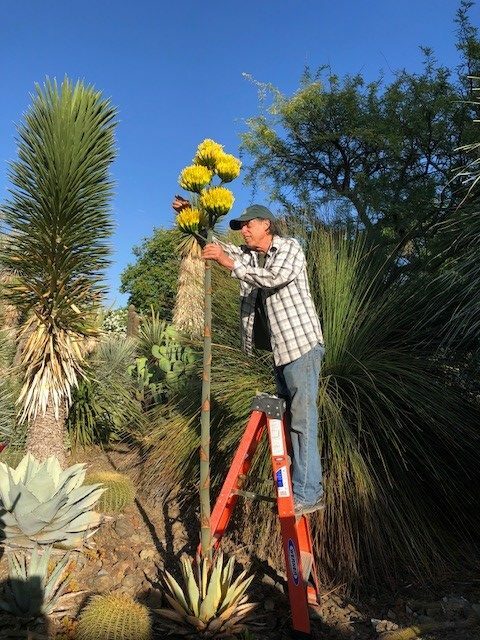 The plant I am pollinating is an extra-small form of Agave parryi (the Artichoke Agave), which was grown by Ruth from seed more than 30 years ago. Because this is a very cold-hardy species, I wanted to use it for hybridizing – it is always good to have Agave planting options for people who live in places where freezes in winter are a fact of life. I pollinated it with Agave montana and Agave parrasana, two other cold-tolerant species, and will now wait to see if seed pods develop to indicate I have been successful. It is worth noting that RBG has quite a few Agave hybrids planted out which have resulted from my hybridizing over the years.